Not many may be remembering that 3rd ODI against England at London in Sept 2004 which India won by 23 runs and Sourav Ganguly was the man of the match. He hails from Chennai and emulating Dhoni’s talking style, he had a lengthy talk with Washington Sundar in Tamil – urging the bowler to bowl ekking him that the batsman seems not to be picking and he should bowl fuller (that conversation in Tamil was picked up by stump mike ! during the Nidahas trophy !). He has scored exactly 1000 runs in 23 tests and 1496 in 79 one dayers. He has played 18 T20s too and in fact won the 1st ever Indian T20 (against SA) hitting a 6 in the last ball. – yet most of us thought him to be a spent-force .. .. last year he played his 100th Ranji Trophy match; having made his debut in Ranji way back in 2002 – almost all his mates have retired and some are into coaching including the recently concluded Tamil Nadu Premier league. He too was spoken off as possible replacement to Saha, but perhaps age was held against him. Perhaps he has not got the right honours that he deserved !!! 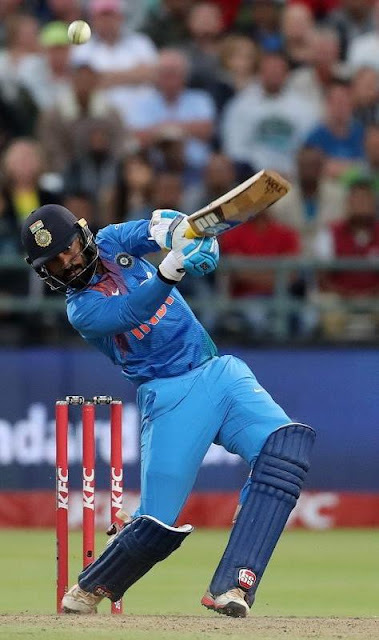 In case you could not figure him out – it is Dinesh Karthik – and he is the hero - single-handedly winning the match with Nidahas Trophy with a last ball six - a stunning 29* off eight balls. The game of Cricket is all about fickle fortunes changing frequently ~ yet this was amazing – the last 3 overs of the 2018 Nidahas Trophy, a tri-nation series between Bangladesh, India and Sri Lanka, conducted to celebrate Srilankan 70 years of Independence and only their neighbours were celebrating. The tourney title derived from the Sinhalese නිදහස් nidahas, meaning "freedom”. India progressed to the final after they beat Bangladesh by 17 runs in the fifth T20I match. Bangladesh joined India in the final, after they beat Sri Lanka by 2 wickets in the final group game. When Dinesh Karthik came to the crease India required 34 off 12 balls. Mustafizur Rahman had just delivered perhaps the over of the tournament. It was pale performance of VIjay Shankar baffled, bemused and clueless. Things totally changed as DK walked in – and changed the destiny with a shortest span of 8 balls. As the great shot cleared the cover boundary in incredible style, his team mates ran in, pushed him to the ground and huddled over - Soumya Sarkar drowned just as Ben Stokes once did. Dinesh Karthik walked in as 34 required off the last 12 balls – bowler Rubel Hossain. The 1st – a low full loss was sent soaring over long-on for a 6 kindling hopes. Next struck for a 4 ; 3rd heaved over square leg for a 6 ; dot, 2 and 4 – all happening – Dinesh had changed the fortunes. Yet 12 off the last .. ?!?!? Soumya Sarkar to Vijay Shankar who could not put bat on to ball – instead of a single, he tried a heave missed and it was no runs. Then came a wide and single and India required 10 off 4. DK scampered for a single, Vijay hit a good 4 and got out off the penultimate delivery. Washington Sundar walked in – batsman had crossed – the best thing that could happen for India. ~ then came that incredible shot off the last ball over cover for a Six and Dinesh Karthik is the Hero. Really a great performance with the bat.